Sinavaiana-Gabbard draws her imaginative strength and mana from the fertile depths of her Samoan people’s mythologies, past, and wisdom, as well as from the cultural soil of North American and Tibetan Buddhism. Her voice is a new blend of Samoan, American, and widely ranging poetic and philosophical languages. A unique, vibrant, undeniable voice which shapes the now fearlessly, with profound understanding and forgiveness. “Growing up ‘colored’ in the American south of the 1950s, amid the hooded dangers of working class, immigrant life, I understood poetry as oxygen. And I wanted to breathe,” writes Caroline Sinavaiana-Gabbard, born in Samoa, and now a professor of literature at the University of Hawai’i Manoa. 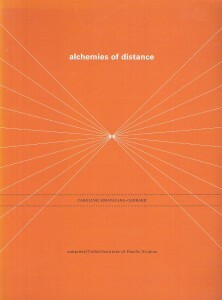 Alchemies of Distance contains 20 poems that alternate between lyric and narrative, verse and prose. At a local fair, a shopper has a heart attack amid “bric-a-brac & over-priced t-shirt dresses dried grasses in garish colors, gaily be-ribboned clumps of pathos, fake tapa & hawaiian deities air-brushed on tanks & tees.” Another poem tracks a “thing with feathers,” finding it in southern Florida, Berkeley, Samoa, Hawaii, and New Zealand, ending up at “Turtle Island the wakened song of your long dreaming and wandering into sunrise. Haere Mai.” Haere Mai is Maori for welcome. Published by Subpress/Tinfish/Institute of Pacific Studies. Caroline Sinavaiana-Gabbard was born in Utulei village, Tutuila, Samoa. She completed degrees in English and Psychology at Sonoma State University, an MA in Folklore at UC Berkeley, and a PhD in American Studies at the University of Hawaii. Her poetry and scholarship have appeared in national and international journals and current projects include co-editing a mixed-genre collection of indigenous writing by Pacific women, Women Writing Oceania: Weaving the Sails of Vaka.